Cameras are so ubiquitous that it’s easy to forget what amazing pieces of technology they are, high-end DSLRs in particular. Check out this 10,000 fps footage from The Slow Mo Guys if you want to see just how complex. As the video explains, DSLRs use clever optical tricks to get everything done. A mirror bounces up the image coming through the lens through a prism so you can look through the viewfinder, for instance, while simultaneous redirecting some of the light to an autofocus sensor. 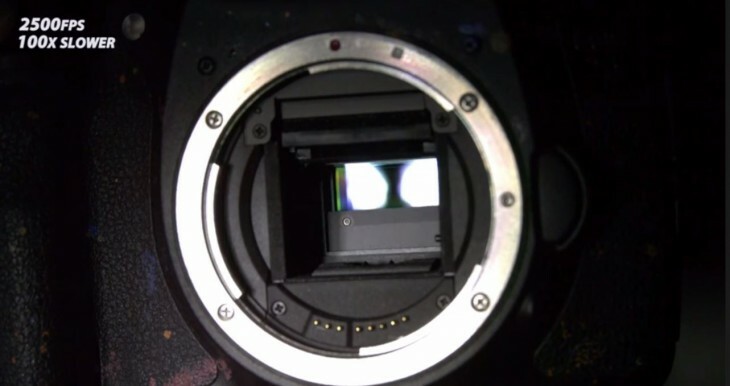 As soon as you press the shutter button, however, that mirror array flips up, allowing a separate shutter mechanism to expose the sensor (hence the “reflex” part of Digital Single Lens Reflex”). If that alone doesn’t impress you, consider that some professional cameras are able to perform this movement quickly enough to only expose the sensor for 1/16000th of a second, cycling the mechanism over 10 times per second. The video’s a little lengthy – skip to 0:58 if you want to get to the action – but it’s worth your time if you’ve ever been curious about how cameras work.